2015 and 2016 were the two hottest years ever recorded; we should not be surprised therefore to find our oceans to be showing signs of stress as the delicate balanced eco system is also being stretched to its limit. Bill Sydeman, a senior scientist at California's Farallon Institute, said he believes the most likely scenario is that the deaths are related to a massive blob of warm water that heated the North Pacific last year and contributed to California's drought and to 2016 being the hottest year on record. That water was hotter and stayed warm longer than at any time since record-keeping began. It stretched across the Gulf of Alaska, where a high-pressure system blocked storms, preventing the water from churning to the surface and mixing with air. More warm water eventually moved inward along the coast as far south as California, altering how favorable the environment was for the zooplankton that many fish and birds, including Cassin's auklets, feed on. 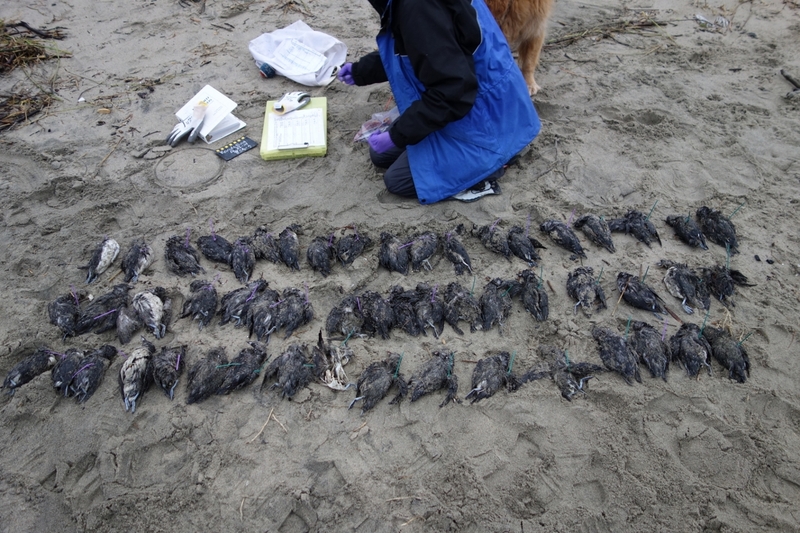 Last year tens of thousands of common murres were the victims, an abundant North Pacific seabird, starved and washed ashore on beaches from California to Alaska, researchers have pinned the cause to unusually warm ocean temperatures that affected the tiny fish they eat. A year after tens of thousands of the common murres died, John Piatt, a research wildlife biologist for the U.S. Geological Survey claims the deaths of the common murres is an indicator of the regions' health. "If tens of thousands of them are dying, it's because there's no fish out there, anywhere, over a very large area," Piatt said. It is thought 500,000 of the common murres, who look like thin penguins, died last year all though this could be just a conservative guess because only a fraction of the dead birds likely reached the shore. Spot on! No real solution can I see for the next 10000 years. The Pacific is destroyed as far south as lower Chile. If you wanted to destroy 1/3 of the oceans in the world this was the perfect plan. Definately not a time to raise a family. Younger people don't have much to look forward to. Older retirees had the best of times growing up thru the decades, now most everything is contaminated, along with GMO's and crowded cities. I second that 300 tonnes of radioactive water flow into the Pacific every single day and has been doing so since 2011. May be, could be, possibly be. Until the biologist and vets can discover what is actually killing the animals, all this is just conjecture as you jump on the most obvious band-wagon, which Fukushima. There has been no definitive proof one way or another that radiation is actually killing those marine animals. When it comes to "Warm Water" you can blame HAARP, Geoengineering and ChemTrails etc for most of our weather problems. The other culprit is our Sun which is being affected by Planet-X which is now becoming more and more visible to the naked eye as it interacts with our small solar system. If our tides can be affected by our moon, then you know that everything on the planet is affected by our sun and other heavenly bodies. Ask yourselves this my friends; Why is humanity becoming more and more hysterical in its approach to everything? Another story about die offs that are "unprecedented" or "epic." This story is similar to the millions of small fish that dies last week. My point? The pictures do not back up the story. There are not enough dead birds in this photo to fill a shopping cart. Am I a Fukishima denier? Hardly. I just want the truth but these stories are not convincing. What is the motive? I do not know, yet. planet x is a farce, you tube this-"THE EARTH IS FLAT, JUST DON"T TELL ANYONE" wake up sheeple. How long do you people think you can keep printing these BS stories and have your readers believe it. Ever hear of Dana Durnford, the Nuclear Proctologist? Y'all can start writing about the "F" word now, you're beginning to look complicit in a cover up. Warm water.....pffft! I want to say a Special Thanks to Gary Walton who compilate all those facts for us.The big Wobble is a reliable source of information to me, no matter what comment say. Thanks Gary. If I were the photographer for this story, I would be renting a geiger counter before standing among those irradiated bird corpses on the beach. DO NOT SAY FUKUSHIMA OR RADIATION .THE RADIATION PLUMES FLOWING DOWN THE WEST COAST DO NOT EXIST. Otherwise, I would have heard about it on the nightly news.